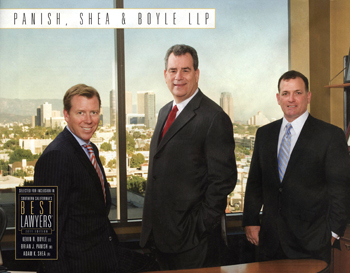 Panish Shea & Boyle LLP is proud to announce that its partners, Brian Panish, Adam Shea, and Kevin Boyle, have been chosen for inclusion in the 2011 Edition of Southern California’s Best Lawyers®. The publication, which highlights the firm’s partners in the area of Personal Injury Litigation, is a supplement to The Los Angeles Times. Attorneys selected for this honor are also included in The Best Lawyers in America® publication. Earlier this fall, Panish Shea & Boyle LLP was named a “Tier 1” Plaintiffs Personal Injury Litigation Firm by the U.S. News Media Group and Best Lawyers® in the 2010 Best Law firms rankings. This ranking in the Plaintiffs Personal Injury Litigation area was only awarded to five law firms in Los Angeles and to just twelve law firms in Los Angeles County. Over the last five years, Panish Shea & Boyle LLP has obtained over fifteen verdicts and settlements in excess of $10 million. The firm’s lawyers collectively have obtained more than two-hundred verdicts and settlements over $1 million, including 3 out of the 4 personal injury verdicts in California history exceeding $50 million. These three landmark cases include Anderson v. General Motors ($4.9 billion); Griggs v. Caterpillar et. al ($58 million); and Lampe v. Continental Tires ($55 million).